That's right – my largest digital marketing client over the past two years has been a jeweler that specializes in loose diamond sales and custom engagement rings. I've held numerous loose diamonds in my hands, inspected them with jewelers' tools, seen the custom ring building process first hand (it's pretty cool), and even sat in on client interactions and sales. All of that was to learn more about the products (diamonds and engagement rings) so I could write about and market them more effectively, but in the process I've basically received an informal diamond education. There's no doubt in my mind that I'm one of the only personal finance bloggers that could sit in and at least attempt to sell a diamond to a customer. Most people don't buy diamonds for a good price, even though they think they do. The unfortunate reality of the jewelry industry is that the product is completely foreign to the customer, so it's not too hard to sell diamonds with crazy markups or poor quality without anyone knowing differently. A lot of jewelers are great, honest people. There are ones that aren't though, and they mess it up for everyone else. You can look up all of the diamond “4 C's” articles you want on Google, but diamonds are actually much more complex than the average person takes the time to learn. It takes gemologists years to get their educations, and it's a rigorous process that involves a lot of schooling. Every single mall jewelry store that you've heard of (with the exception of Tiffany, and I'll get to that shortly) sells diamonds that are poor quality for a highly marked up price. You might be wondering how they get away with it, but it's pretty simple. Those stores spend tons of money on advertising, and try to get customers to attach emotion to the purchase instead of reason and information. Mark ups on diamonds in stores like Zales, Kay, and Jared are often 100% or more. If you pair that with the use of poor quality diamonds, you're probably going to get hosed. Tiffany is the one exception from a quality standpoint. Their diamonds are really, really awesome. But, you're going to pay a heavy premium for the pretty blue box. You can get the same quality of diamond elsewhere for a much better price. Tiffany has a markup of 324% above their acquisition cost (I got that information from a very reliable source). In comparison, low overhead jewelers that I'll outline later typically have 5-20% markups. The other huge issue with mall stores is lack of negotiating room. Not only are you fighting with one hand tied behind your back because of the already high markup and low quality diamond, but there's often no room for driving the price down. They just don't have to negotiate with you. If you don't do anything else on this list – you'll at least save money by avoiding mall chains. Specifically, look for family owned jewelers that work in office buildings, don't have billboards, or maybe work in what I'll call a “diamond complex”, which is a high security office building that houses many jewelry companies. You'll want to find a store that has been around for 10-20 years and has a great reputation and reviews online. Google is the best place to find these types of jewelers because it's very common for smaller jewelers to rely on SEO (Search Engine Optimization) to reach new customers in lieu of TV or radio commercials and billboards. It's much cheaper and fits their business model better. If you're wondering about the actual ring part of the equation, most of the time small family-owned jewelers have a good relationship with a custom engagement ring designer. If you find a really good one – they'll have that service in house. While internet stores can have some really good prices on their diamonds, there can actually be a little bit of a catch on some of their “best deals” if you don't know enough about the specs. This is where complexity of diamond grading can come in. While all jewelers sell these types of stones, you aren't going to have someone to sit down with that explain this concept to you. Most people have heard of the four C's (cut, color, clarity, and carat weight), but many people don't understand that there are ranges within clarity and color! Many times, retailers will sell a SI1 diamond that is on the lower end of the SI1 range. It's not an awesome SI1, but you can't really compare that diamond to another one in person. In my opinion, the only way to know for sure is to go to a jeweler and literally hold the diamonds and compare them. You're rolling the dice a little bit with online retailers because your ability to compare is limited. It's not that online diamond retailers are trying to trick you, but you're just more likely to purchase a diamond that's not as good as one you could have bought in person (unless you really know what you are looking for). Great deals can be had online, but you need to really carefully consider each diamond and determine why it's priced the way that it is. This isn't really a trick, but it is a reality of the online business model. People want to see diamonds up close and in detail because they want to know what they are buying! Online retailers meet this need and try to create trust by showing the diamonds in 10x magnification in their pictures and videos. It's important to evaluate diamonds at 10x magnification for verification that the diamond is what the jeweler tells you, but nobody will EVER look at the diamond that way again (unless your significant other is…particular). The best way to buy a diamond is to hold it in your hand and look at it without magnification the way everyone else will see it. I'm not saying 10x magnification is bad at all, and online retailers are just doing their best to provide transparency to the customer. But, you might accidentally spend more trying to avoid a flaw that can't be seen in real life anyways. My wife's diamond is an SI1 because it has a feather inclusion (basically a small crack) that I have looked for over and over again and can't find without magnification. She can't either. I even know exactly where it is and still can't see it! If I had looked for that diamond online, I probably wouldn't have bought it and paid more for something else without that flaw. I'm going to use one carat again, because it's a very popular carat weight. A one carat weight diamond, even if it looks the same size or smaller than a .99 carat diamond, will cost more. There is a premium put on the whole number carat weights because the demand is so high. You can buy a slightly smaller diamond for a better price than a whole number carat weight, and it can actually look bigger if you know what to ask for! It has to do with the table percentage again, which is the top portion of the diamond. Ask whatever jeweler you are working with to show you a slightly smaller diamond with a large table percentage, and a one carat diamond with a smaller table percentage at the same time so you can compare. Like I mentioned earlier about my wife's diamond, inclusions and clarity grades vary greatly. Don't get stuck with the mentality of “I HAVE to have a VVS1 diamond”, because a VVS2 or SI1 may actually look better. There are just so many factors that go into how a stone looks. 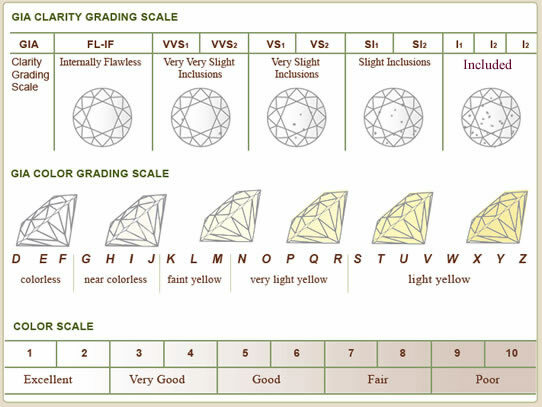 I don't want to bog down readers with the specifics, but it's important that you understand that the grades don't matter nearly as much as how the diamond fits in your budget and looks in real life. This is huge. GIA, or the Gemological Institute of America, is the gold standard of diamond certification and education in the industry. A certification protects the consumer by providing an independent assessment of the diamond. Basically, it helps a customer know that the diamond is exactly what the jeweler says it is. When you buy a diamond, you always should ask to see the GIA report. Jewelers that sell GIA diamonds buy the stones and then send them off to the GIA, where the diamonds are independently evaluated by four gemologists. The diamonds are given grades and a report, then sent back to the jeweler. 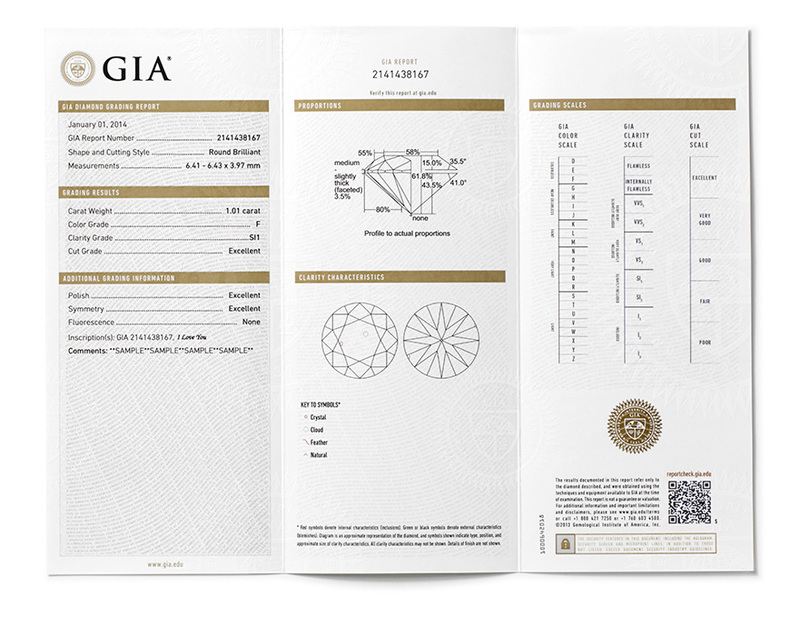 The GIA is non-profit, 100% independent from jeweler influence, and has the strictest grading standards and highest grading accuracy in the industry. If your jeweler is trying to sell you an EGL, IGI, or “independently certified” diamond, think twice. Some jewelers don't like the GIA because the process takes a while. That means that they have to hold on to their diamond inventory for longer during the certification process, which means they can't make a profit as quickly on inventory that they may or may not have borrowed money to buy in the first place. Many jewelers that can't afford to wrap up their money in inventory for too long will use EGL or IGI instead, which are services designed to give them their diamonds back quickly. So basically, it's better for the jeweler than the customer, which negates the point of independent diamond grades. 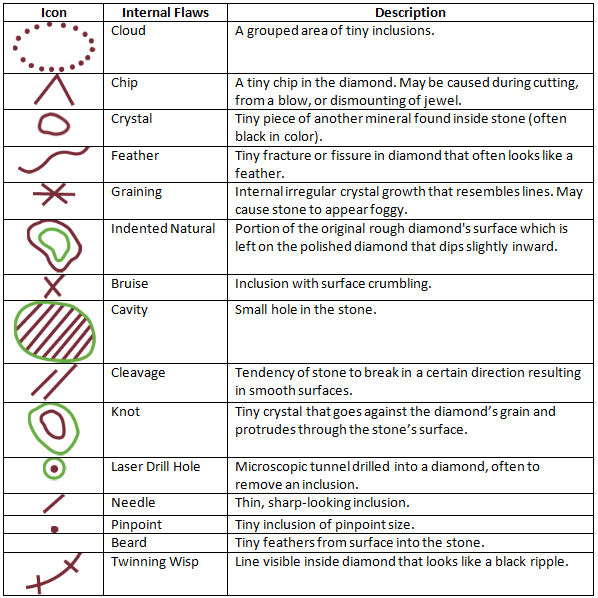 Also, EGL and IGI commonly have diamond grades that are 2-3 grades off from what the diamond actually is. They just aren't as accurate as GIA reports, which means you might be buying a diamond that isn't what you thought it was. AKA: wasting money. Above all else, avoid mall stores, find a reputable jeweler with low overhead, and don't get too wrapped up in diamond specs and grades. Go with something that comfortably fits in your budget and looks good to you in real life. As much as it's a symbol of love, it's also a fancy rock. One last note – if you are stuck between two diamonds and price is the only significant difference, go with the cheaper diamond. Your significant other will never see the other diamond and be able to compare in real life. They'll love whatever you buy for them. If you've bought a diamond before, did you think it was a stressful process or easy? Wow, who knew there was so much disparity between diamond sellers and their mark-ups! It makes sense to go to smaller independent shops for fairer prices – it’s strange how sometimes all that advertising high-street retailers invest in actually backfires! Haha yes bookmark it for him! It’s weird in the jewelry industry – you’d think that the bigger stores will have a better deal because they have more diamonds, but it’s just not the case. My personal favorite way? My Uncle is a jeweler. Diamonds and bands at cost. Saved an INSANE amount of money and got gorgeous jewelry too. This is a great article though and very informative. Would have been a good one for my blog audience lol! Haha yes having one in the family is always way better! No kidding, that was fascinating insight! Thank you for posting this! So many people default to the big box mall stores for these rings, but they’re committing highway robbery. We opted for a smaller, family-owned jewelry store. I found a ring I loved. Mr. Picky Pincher went in there, cash in hand, and offered to pay below their asking price. He knocked an extra $400 off the cost of my ring because he paid in cash instead of financing it! No problem! Those stores sell a sub-par product for a high price. It’s a bummer. Another tip on engagement rings is to have the focus on a non-diamond stone, with either diamond accents or no diamonds at all! Mr. Adventure Rich picked out my ring knowing only that I wanted it to be reasonably priced and I wasn’t attached to diamonds. He surprised me with a gorgeous Orange Sapphire (I had no idea that existed!) that has a small diamond on either side. The fact that the main stone is not a diamond dramatically reduced the cost and made my ring truly one of a kind!!! Yes DEFINITELY check preferences, but if the person that’s going to get the ring is in to alternative stones, it can be a good way to go. I think you can take the savings one large step further! Wow, very detailed! Having bought a diamond ~17 years ago, and now having been happily married for 16 years, I now ask the question why buy a diamond at all? What’s it for? You? Everyone else? Now you have a multi-thousand dollar item that you have to insure and care for. Does a diamond mean you love someone? Is it the way to signify they are serious? Yes, I am a male, but my wife agrees completely. A ring that she finds to be beautiful, as a symbol of our wedding, that’s what she finds meaningful. Note: I had a friend where the jeweler had forgotten to replace the cubic zirconia in their ring with the diamond. They didn’t discover this for ~8 years. The whole time, they were completely happy, it didn’t affect their life at all! I hope this doesn’t sound negative, but I just don’t like ANY purchase where I am blindly following the customs of the broke (society). If you want a diamond, great, just think through why! I think that’s fair, and while alternative stones or synthetics have a small foothold of popularity with millennials, the reality is that most couples will still buy a diamond. I might as well share what I know about the industry so they can do it a little cheaper. 1) Don’t get a large diamond that can attract a thief. 3) get your valuable jewelry insured. I was stalked by a meth addict because of my 3 carat solitaire (5c total), and $40,000 worth of diamonds/gold jewelry (not my ring, had it on when burglary occurred) were stolen out of my home. Not locked up and no rider policy on my home insurance. Don’t make the same mistake that I made. Yes I agree – always have a safe for valuables! I’ve always wondered about the obsession with color and clarity. For the most part I never notice nor think about those things when I see someone’s diamond ring. Definitely sending this to a few friends who are thinking of proposing soon! If I had to pick one of the two, I’d say go with a higher color grade than a clarity grade. Color is more noticeable from a distance than a significant inclusion (in my opinion). My engagement ring actually belonged to my husband’s great-grandmother, who passed away about a year before we got engaged. My husband did have to put some money into it, because the band needed repaired, but he saved a ton of money, and I have never seen another person who has a ring like mine! I have heard some people say that passing down family jewelry is “cheap” or “hokey”, but I think its a great way to save money, and to keep family memories alive. I think that’s an awesome thing to do! This is a LEGIT guide in saving money on diamonds! Well done. Pretty cool your digital marketing client is a jeweler. I bet learning all about the industry really helps you market and run Facebook ads for them. Haha thanks! I was writing a diamond post for a client and decided to bust this one out too. I did one a while ago, but didn’t know nearly as much as I do now. Do you have any thoughts on whether buying diamonds in the Caribbean is actually cheaper? I’ve heard mixed reviews on buying in the Caribbean and I’m sure the “big box” Caribbean retailers (like Diamonds International) have a huge markup. I would appreciate any thoughts you have. Thanks – love your blog! I wouldn’t be comfortable doing that honestly. Just find a small local jeweler and you’ll do fine. Diamonds International probably still sources their diamonds from the same places that everyone else does. I’ve been on many cruises throughout the Caribbean and diamond prices vary a great deal. If you are serious about buying have a carat size, shape, color etc and price. Go to the MANY (And I mean that because there are 10 jewelry stores on every block) stores, look at their wares and offer them half price of what they want as a negotiating starting point. If they won’t haggle say thanks and move on to the next store until you get what you want. Just my 2 cents. Lab-grown diamonds are definitely interesting – I’ll be keeping an eye on that industry’s growth in the coming years. I already have a ring on my finger for 2 months now, but couldn’t resist to read it! Luckily the mister did his homework. He almost checked on all of your points. Except for the local jewelry store. We live in the Netherlands, so he bought it in the diamond capital, Antwerp. He found a distributor there through a colleague of him that normally sells only to stores directly, and got a major discount as well. The fuss of having a diamond wasn’t really that important for me. But the trouble and effort he took to find it, made it actually worth a whole lot more in my perception. Haha yeah I’m glad he did most of this! I was a little worried I’d bum out some recent buyers (especially if they went with a mall store). I was literally just talking about this to my girlfriend this week, and started writing an article about it. Do you mind if I link yours as part of the post? Thank you for sharing this with the PF community! I do think that it is very easy to get sucked into the ‘engagement means a diamond’ trap. I didn’t get a diamond in the end. We decided on a moonstone ring for about £70 ($90) from my favourite jewellry designer. I just didn’t feel comfortable with the thought of him spending thousands on a piece of jewellery! I’d rather we used the money for awesome holidays, I’m all about travel/memories over things – understand everyone is different though! Excellent article! With each paragraph I felt a huge sense of relief! Thanks for keeping us aware of aware of what to look out for when making such a huge investment. Thank you for mentioning that it would be a great idea to find a smaller, family owned jeweler that is in the middle of a lot of other jewelry stores since they will most likely offer you the best price. My brother is planning on proposing to his girlfriend and is looking for the perfect diamond ring for her. I’ll have to tell him that he should seek out a family owned store that has great reviews. Thanks for the tip to ask a jeweler about seeing a slightly smaller diamond with a large table percentage, and a one carat diamond with a smaller table percentage to compare at the same time when looking for a ring. I am thinking of looking into loans for jewelry so that my fiancee and I can get wedding rings. Being able to save money and potentially get a larger looking diamond by checking for higher table percentage is something we’ll have to try out when we go ring shopping.